Schindler Lifts automates its FE calculations with CAE tools from MSC Software. Schindler is market leader in the lift and escalator sector and has offices in all five continents. Schindler’s offerings range from passenger lifts suitable for small blocks of flats to sophisticated transport solutions for skyscrapers. Service lifts ensure the stress-free movement of goods and people in shopping centers, office buildings and railway stations. Bed lifts provide for the smooth and vibration-free movement of patients and equipment in hospitals. In industrial buildings, many of the hoists and small goods lifts in use are supplied by Schindler, while glass cabin lifts in tall buildings offer both a novel experience and a feeling of safety. It is hard to imagine public transport without lifts, which are often heavily used and must therefore meet demanding requirements in availability and serviceability. The concern’s research and development facility in Ebikon devises complete lift systems as well as components for all applications. Here, CAE simulation is used to find reliable and energy-efficient solutions which make the optimum use of materials. The programs SimXpert and MSC Nastran from MSC Software are employed for structural calculations using the finite elements method (FE). These are used, for example, to simulate the wall fixings of lifts and determine whether deformations and loadings remain within the permissible range. The resulting design and its verification encompass the guiding system and the cabin, counterweight and drive components. In addition to static (strength) calculations, dynamic and vibration analyses are also carried out with the aid of FE methods. The field of non-linear FE calculations is also of central significance. The finite elements solver MSC Nastran is capable of carrying out linear, nonlinear, dynamic, thermal and many other calculations. MSC Nastran can look back on a history of almost 50 years. Originally a component of a NASA project, it was further developed into a comprehensive program that is now standard in many aerospace, automotive and mechanical engineering companies. Historically, Nastran from MSC Software has a reputation as a high performance solver for static and dynamic calculations and is a leader in meeting the continually growing demands on model size – currently models with hundreds of millions of degrees of freedom. In the last decade, it was expanded to the multidisciplinary “MD” Nastran, which can cover all disciplines in structural calculations. It now includes a comprehensive range of non-linear algorithms, contact and material models, including crash simulation. MSC Nastran can carry out design and layout optimization without the need for any additional optimization program. MSC Nastran is closely integrated with MSC Software’s multi-body simulation program, Adams, and provides an open interface for CFD programs. SimXpert is a modern pre/post-processor that creates a model for MSC Nastran finite element calculations based on CAD geometry. SimXpert supports not only structural calculation but also multi-body simulation, regulation and control systems, making the linking of the different disciplines easy. A key feature of SimXpert is the ease with which it automates the generation of the model and the calculation using templates. Macros can not only be drawn up as in the customary programs but also edited in a flowchart mode. Additionally, a Python interface is available to users with programming knowledge. At run time, the user can interactively change the inputs. This is useful if, for example, the work flow is predefined by an expert and is to be applied by other users. This template-based automation made SimXpert interesting for Schindler. The calculation of bolt forces and weld seam stresses is important in the design and verification of lift structures. This requires an appropriate FE mesh. The weld seams of shell elements must be of uniform size and perpendicular to the edges. The generation of such a mesh is very time-consuming. Templates were therefore created that automate the modeling of bolted joints and weld seams. 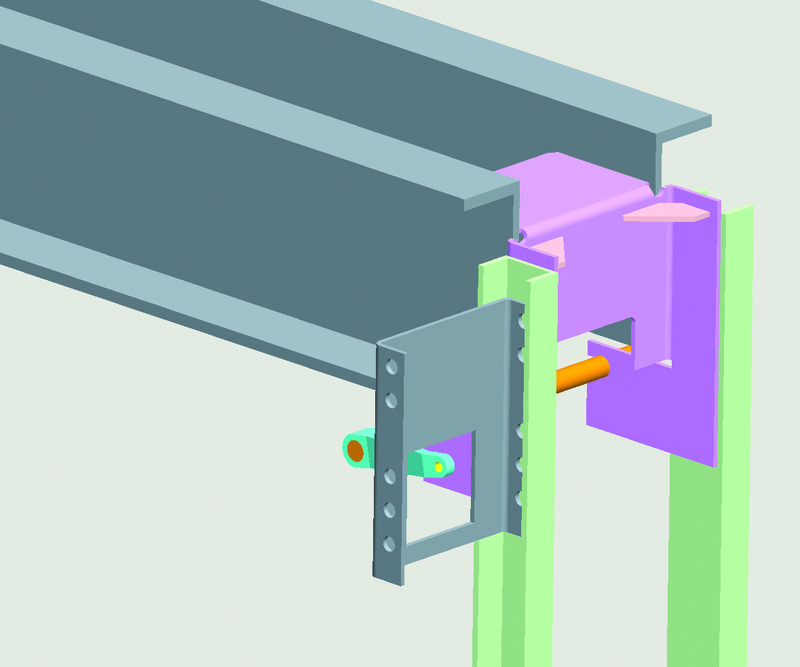 In the bolts template, two or more plates are connected to beam elements and rigid body elements (RBEs) and holes are produced in the plates (if not already present). As a result, the FE mesh forms concentric circles around the holes. In the weld-seam template, two plates that previously did not have matching meshes are joined. For a T-joint, 3 different areas are set up. In this figure we see a simple example showing the initial model (3), and then the same model after application of the bolts and weld-seam template (4). The stresses in components with beam elements or weld-seam elements are evaluated after the calculation. Considering that there may be 20–30 beam elements and hundreds of weld-seam elements in a model, automating the output of the results are highly desirable. To this end, a SimXpert template was written that reads the stresses from the binary results file from Nastran and outputs them in Excel format (figure …(6)). The Excel file includes formulae for further evaluation. “We use MSC Nastran and SimXpert because an efficient use of CAE tools is now a decisive factor in the development process. Thanks to SimXpert and template-based modeling and evaluation, we can ensure that we construct consistent models and also have repeatability in the simulation process. At Schindler, the modeling process can thus be methodically and centrally structured and made available for use by internal development departments spread across the world, as well as by external service providers. The advantage is that automated processes can help us to model and evaluate a greater number of design variants. This fosters innovation and helps us retain our lead over the competition. It also guarantees standardization of the simulation process and ensures that we are able to continuously improve quality,” explains Schindler’s Werner Moretti. SimXpert templates free engineers from monotonous, time-consuming modeling steps; leaving much more time available for assessing and optimizing designs. The content in this blog post was originally sourced from our customer case study with Schindler. Attend our upcoming webinar titled Accelerate your High Performance Computing. Watch our YouTube webinar titled Contact Analysis. Watch numerous presentations on nonlinear analysis on YouTube. Visit our MSC Nastran and SimXpert page.